Disadvantages: Profile errors, some points needs cross checking. Renewed interest in World War I aviation has meant a flood of new kits and books over the last few years. It’s nice to have Kagero fuelling this with a number of recent titles and their latest concentrates on the efforts of Jasta 11. There are seventy-two pages contained in the usual soft cover format. Over eighty black and white photographs are represented and these are printed on good quality gloss paper. Most are reproduced larger than what is seen in other publications but sadly the sharpness of some of these images has been compromised. A number of photos have been incorporated into the publication where one can only wonder at the reason for their inclusion. Images of present-day Wroclaw station, a “replica” Fokker Dr.I and transport vehicles of 3 Sqn AFC are strange additions indeed. Some excellent artwork has been presented in the book and covers 26 different aircraft. 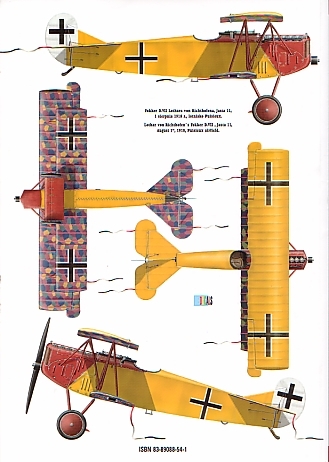 Various types have been portrayed including the Albatros D.II/ D.II/ D.V, Fokker DR.I/ D.VII, and Pfalz D.III/ D.IIIa. Again one has to question the admittance of some of these profiles as the book is meant to be about Jasta 11 and not JG I. Thus there is no need to have an unknown Pfalz from Jasta 4, another from Jasta 10, Heldmann’s Albatros D.V (also from this unit), Nickel’s Jasta 4 Fokker D.VII, and Bassenge’s Albatros D.III…amongst others. Sadly the profiles themselves are not without fault. The pre-production triplane is drawn as “Fok Dr.I 102/17” and captioned as such. It is also painted with wing tip skids! Surely this sort of mistake is a thing of the past. Unfortunately Richthofen’s Fok. Dr.I 425/17 is presented with blue undersurfaces…the illustration caption even claims this to be the scheme on 21st April 1918. 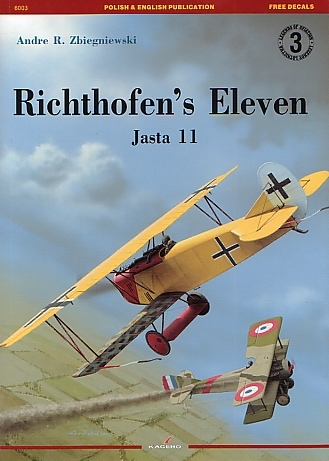 Schaefer’s illustrated Albatros D.II is erroneously described as a D.III of Jasta 11 but was actually with Kasta 11, Kampfgeschwader 2. The Pfalz D.IIIs given in the plan view show a three-piece upper wing that has gaps as wide as those attaching the ailerons to the wings. This gives a very wrong impression of this aircraft to the uninitiated. Other schemes show variance with traditionally accepted profiles such as Goerings Fok.D.VII F5125, seen here without the “cut-down’ cockpit or grab handle. Bassenge’s Albatros does not have its upper fuselage stripe, “straight” streaking is represented on Stapenhurst’s (and other triplanes) wheel covers, and interestingly…turquoise is used more liberally as the background colour on many of the Dr.Is shown. Thankfully the text concerns itself with the title of the book. Here the author presents his information in a clear and easy to follow style. Although the translation from Polish is obvious, the “flow” does not suffer and the author keeps up a tremendous tempo. The writer’s enthusiasm for the subject is quite obvious and very welcome. The reader is introduced to Jasta 11 as an independent unit, and follows the fortunes of its pilots as they group with Jasta 4, 6 and 10 to form Jagdgeschwader Nr.1. From there the author takes us to the war’s end with many interesting accounts of their exploits. There is the occasional piece of information presented that will raise an eyebrow and the reader is well advised to consult with other sources. An appendix gives various tables and they include data on the Jasta 11 Commanding Offices, Bases and aerial victories. 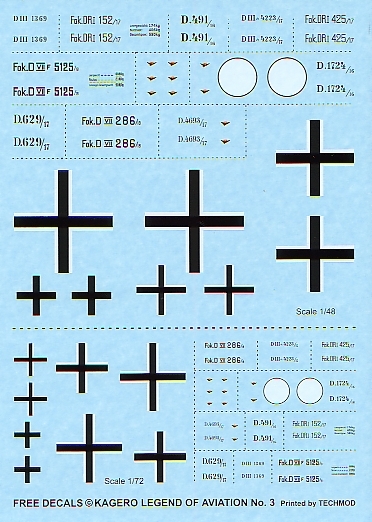 A lovely decal sheet is supplied with the book and this contains markings for ten aircraft. Both 1/72 and 1/48 scales are represented and the markings cover a variety of aircraft types. All are illustrated in the book. My example was in perfect register with very thin carrier film. Most of the items consist of serial numbers but this is not a problem as the colour schemes can be easily masked. Thoughtfully Kagero also supply a generous quantity of Albatros logos. I consider that this book is something of a mixed bag. While the author should be applauded for attempting such a subject, it is a shame that the overall package is let down by some basic inaccuracies. Cross-referencing with other material is essential.